Late Comb Ware pottery is found especially in coastal areas well into the Corded Ware period (after ca. 2500 BC), probably withstanding cooking and thus used for processing of marine products. Comb Ware settlements, faunal assemblages and the size and fragility of Comb Ware vessels suggest that these populations were sedentary, with a specialised economy based upon coastal resources (Oinonen et al. 2014). The decrease and even lack of archaeological material from the later 3rd millennium BC onwards has been explained by decreasing population numbers, which would have been caused by the deteriorating climate, characterised by cooler seasons at the end of the 3rd millennium BC. However, the abundant number of burial cairns and pollen analyses showing anthropogenic activities indicate that no complete depopulation took place, so the change was mainly in ways of leaving and material cultures, which left materials difficult to identify archaeologically (Nordqvist 2018). These changes seem to be connected to external influences. The Corded Ware culture disappears (ca. 2300/2000 BC), and on the coast, the Kiukainen culture appears ca. 2300 BC, coinciding with cultural impulses from the Estonian Western Textile Ceramic tradition – different from the eastern Textile Ceramic or Netted Ware (appearing in eastern Estonia ca. 1700 BC). After ca. 2000 BC, two Corded Ware-related cultures remain in the region: in the coast, the Final Neolithic Kiukais or Kiukainen culture, derived from the original Circum-Baltic Corded Ware settlers, reverts to a subsistence economy which includes hunting and fishing, modest swidden cultivation, and bronze metallurgy, keeping mainly settlements from the best territories along the coast, including the Gulf of Finland (Nordqvist 2018). In inner Finland, another Textile ceramic tradition appears ca. 1900-1800 BC, connected to the northward expansion of Netted Ware from the Mid-Volga area (see §VIII.15.3. Netted Ware, Chirkovo, Kazan). The ceramic inventory of the Kiukainen culture shows similarities with late Corded Ware, but also to local hunter-fisher-forager ware (Pyheensilt and late Comb Ware), and is believed to be a cultural amalgamation and reversion to aquatic foods emerging locally. Pottery residues show a mix of ruminant and non-ruminant/marine products, which suggests that (compared to Corded Ware) this culture used a less-specialised economy, probably reintroducing aquatic resources to complement diminishing terrestrial sources, as is historically common among Scandinavian cultures (Cramp et al. 2014). Later, the Kiukainen culture probably spread with the custom of burying chiefs in stone cairns to Estonia. The Kiukainen culture evolved into the Paimio ceramics in south-western Finland, and the corresponding Asva Ware of Estonia, whose influence over the area spans ca. 1600–700 BC. This continuity supports the maintenance of close cultural connections through the Gulf of Finland after the demise of the Corded Ware cultural complex (Parpola 2018). Like the isolated Bell Beaker findings of the eastern Baltic, Finland, and Belarus, isolated Bell Beaker findings in the northernmost territories of Norway have to be interpreted in the context of the initial expansive phase of the Bell Beaker peoples, before their integration into distinct regional cultures. The dichotomy marked by environmental constraints in Scandinavia appears throughout the whole Nordic Bronze Age period, evidenced by the lack of relevance of centres of dominant chiefdoms in northern and mountainous regions, where metal is scarcely known at all. 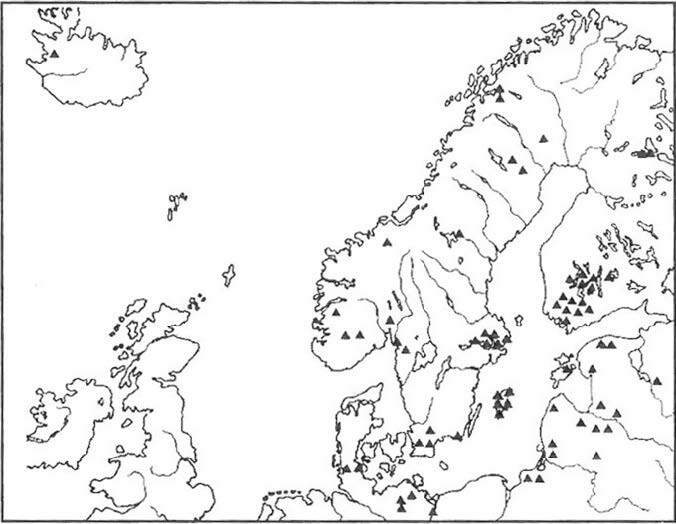 This difference is as relevant between these regions as between the Nordic Bronze Age and Norrland and Finland: for all these groups of foragers and tundra hunters, metal objects and technology must have seemed as fabulous as when bronze was introduced in the south (Thrane 2013). The relationship between southern and northern Scandinavian groups has been described as indirect, based on reciprocal exchange and ideological dominance (Kristiansen 1987). North Scandinavia shows continuous eastern connections and a Mesolithic way of life, using quartz for flat-based points and scrapers between 1500–500 BC. Small coastal huts were common. Seal oil found in the Nordic EBA was produced in the Åland islands in the Baltic. 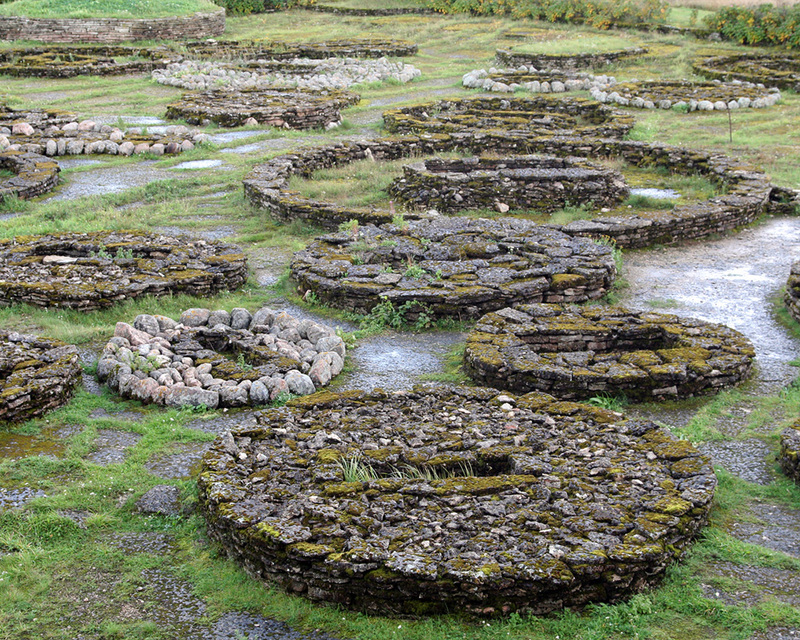 Asbestos-tempered pots reaching up to central Sweden at the end of the 3rd millennium BC show a decoration and technique evidencing connections across the Baltic to Finland via Åland. Containers used in iron smelting are a northern specialty. Burials show southern acculturation, with man-size stone cists and later smaller cists in the cairns along the coast (Thrane 2013). The border with the southern regions ran through Ångermanland in northern Sweden, coinciding with the modern border between sub-Arctic nomads and the Swedish-speaking population. Here farming and agriculture began during the Late Bronze Age, which is difficult to distinguish from the Early Iron Age (Thrane 2013). In northern Fennoscandia, pottery is found only sporadically since 4500–4200 BC until the end of the 3rd millennium BC, and populations are mainly hunter-gatherer communities characterised by seasonal mobility, apparently with specific resource areas. Asbestos temper ceased in eastern Finland at the same time as it appeared in northern parts of Finland and into Norwegian Finnmark and the Kola peninsula, in the Lovozero Ware, ca. 1900–700 BC (Damm 2012). During the 2nd millennium BC, textile impressions appear in pottery as a feature across a wide region, from the Urals through the Volga to the Baltic Sea and beyond, in communities that evolved from late Corded Ware groups without much external influence. It has been traditionally suggested that this stylistic phenomenon was part of a Textile ceramic culture that expanded from the east to the north-west. Nevertheless, the decoration proper of textile ware can be easily copied and spread without much long-term interaction or population movement. In fact, it is possible to see influences proper of horizontal transmission from several directions. In the western area, textile impressions were known since the Corded Ware pottery in Estonia and Finland, and is very common in Kiukainen pottery, immediately preceding Textile wares of Finland. Therefore, groups like Paimio/Asva and western Sarsa show most likely cultural continuity (Lavento 2001). Figure 77. Stone Cist Graves from the Bronze Age in Northern Estonia. Photo of cultural heritage monument of Estonia number 17543. Finnish subgroups often related to the Netted Ware, like Sarsa, Tomitsa, or Kainuu developed quite differently, some from local knowledge and traditions (Figure 77) without any necessary new craftsmen, others probably due to some incoming groups or individuals (Lavento 2001). In fact, Late Textile ceramics from the Gulf of Finland show more similarities with Netted Ware, which supports the presence of changing trends. A general preference for textile impression is obviously seen across all these groups, with different stylistic trends—first western, then south-eastern—suggesting a close association between them, but not necessarily much mobility (Damm 2012). Early Metal Age pottery (ca. 1200–500 BC) shows a strong reliance on dairy products. Increasing population size despite continuing climatic deterioration of the Late Holocene is believed to have arisen from the intensification of agriculture and cattle breeding by the Late Metal Ages, which overcame environmental constraints upon population size (Cramp et al. 2014). On the other hand, the appearance of Textile ware tempered with a variety of materials, but rarely with asbestos, marked a crucial difference with other groups. While Textile ware was widespread into northern Fennoscandia, there are essential regional differences. This phenomenon of abandonment of the traditional asbestos temper probably represents a cultural break, a change in the whole distribution of asbestos through marriage and exchange networks, and thus a reorientation of alliances (Damm 2012). To the west, in Norway and Sweden, these vessels were predominantly tempered with asbestos, which points to a different transmission of knowledge (learning networks) where the use of asbestos continued, although the copying of textile decorations indicate a positive association with eastern communities. To the north, in northern Finland, the expansion of Textile ware represented an expansion of the technology, contrasting with local traditions of sub-Neolithic Lovozero and Pasvik asbestos-tempered pottery (Damm 2012). The influence of Akozino culture reached Finland late, at the end of the Late Bronze Age and beginning of the Early Iron Age, when the influence of the Nordic Bronze Age culture on the Gulf of Finland was already declining. At this time, the Paimio ceramics of the coast evolved into the Morby ceramics in Finland (ca. 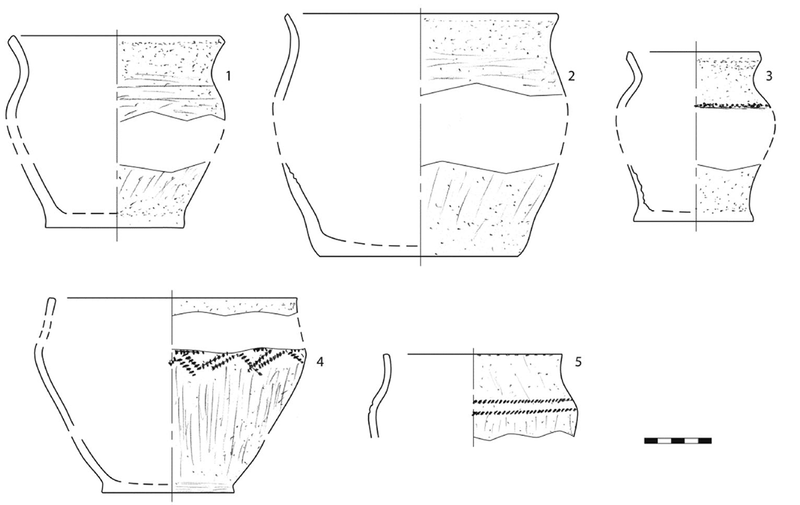 700 BC - AD 200 BC), and the corresponding Asva Ware of Estonia evolved into the Ilmandu style ceramics (Figure 78), also including Latvia, and the Mälaren area in Sweden (Parpola 2013). Figure 78. Reconstruction of some clay vessels from a cist grave in Sondlamägi, Muuksi (ca. 1100–800 BC). 1–4 Ilmandu-style pottery; 5 Cord-Impressed Pottery. Modified from Laneman and Lang (2013). The old Paimio/Asva Ware traditions continued side by side with the new ones, with a clear technical continuity between them, but with ornamentation compared to the EIA cultures of the Upper Volga area. Other pottery types common from Finland and the eastern European forest belt—like the Lüganuse style—also appear in Estonia. Akozino–Mälar axes were introduced into the Baltic area ca. 800–500 BC in such great numbers—especially in south-western Finland, the Åland islands, and the Mälaren area of eastern Sweden—that it is deemed to have involved a movement of people, too (Figure 79). This movement was probably caused by warrior-traders of the Akozino–Akhmylovo culture, following the same waterways that Vikings used more than a thousand years later (Parpola 2013). At the same time as the new ornamentation appears, early tarand graves appear (ca. 800–400 BC) in the coastal areas of northern and western Estonia and on the islands, roughly contemporary with the emergence of similar graves in south-western Finland, eastern Sweden, northern Latvia and Courland. Tarands are described as “mortuary houses”, corner-joined horizontal log cabins, in which ancestral bones were stored, and it is quite common to find them forming long rows of rectangular ‘yards’ or ‘enclosures’. Such ‘houses of the dead’ have their origin of similar burial rites in the Akozino–Akhmylovo culture, and grave goods contain ornaments from the Upper and Middle Volga region, while cultural continuity is evidenced by Ilmandu-type pottery (Parpola 2013). Akozino–Mälar axes are copied in iron in Fennoscandia, with iron being highly valued and rare, and its production technology being a well-guarded secret. Access to this knowledge and to prestige goods was proper of the elites in chiefdom-level societies. Textile ceramic cultures of the Early Iron Age in north-eastern Europe were well armed and possessed hill forts, with those in Finland starting ca. 1000–400 BC, after the Netted Ware expansion. This evolution to a chiefdom-based society—where thousands or tens of thousands formed part of each chiefdom—began slightly earlier than the appearance of Akozino influence and tarands (Parpola 2013). Fortified settlements in the region may have represented visiting warrior-traders settled through matrimonial relationships with local chiefs, eager to get access to coveted goods and become members of a distribution network that could guarantee them even military assistance. Such a system is also seen synchronously in other cultures of the region, e.g. in Vistad in Östergötland, where a fortified settlement within Nordic Bronze Age territory shows Lusatian type pottery and artefacts, suggesting the presence of foreign Lusatian chiefs accommodating long-distance traders in Nordic territory (Parpola 2013). In the later part of the Early Metal Period and initial Early Iron Age, the use of asbestos temper increased, sign of newly made networks with connections to asbestos sources. Asbestos was used infrequently in Finnish Textile ware during the 2nd millennium BC, but was used in Norwegian Finnmark and the Kola peninsula in the Lovozero ware and in the so-called Pasvik ware. Asbestos continued to be favoured in Norway and Sweden during the whole period, and was reintroduced in mainland Finnish wares: in the north with the Kjelmøy Ware (ca. 700 BC – AD 300), which replaced the Lovozero Ware; and in the east in inner Finland and Karelia with the Luukonsaari and Sirnihta wares (ca. 700/500 BC – AD 200), where they replaced the previous Sarsa–Tomitsa ceramics (Damm 2012). Figure 79. Distribution of the Akozino–Mälar axes in north-eastern Europe according to Sergey V. Kuz’minykh (1996: 8, Fig. 2). R1a1a1b1a-Z282 seems to be the only haplogroup found to the north, in Battle Axe and derived cultures (see §vii.1. Western and Eastern Uralians). A late sample also attributed to the Battle Axe culture from Spiginas, Lithuania (ca. 2130–1750 BC) shows subclade R1a1a1b1a2b-CTS1211. Individuals from the Eastern Baltic Bronze Age from Lithuania, Latvia and Estonia (ca. 1230–230 BC) form a common cluster with extra Baltic hunter-gatherer ancestry compared to Late Neolithic samples, a ‘northern’ shift in the PCA toward WHG, and Baltic haplogroups, none of them stemming necessarily from Comb Ware culture-related samples, which suggests that this population did not play a large role in the ancestry of Bronze Age individuals (Mittnik, Wang, et al. 2018). In fact, Bronze Age samples need a further source of admixture beyond a Baltic Late Neolihtic population and foragers, including an increase in NWAN-related ancestry, compatible with the arrival of another wave of Battle Axe settlers from east-central European Corded Ware groups, that possibly replaced R1a1a1b1a3-Z284 lineages in the area, or contributed to a Y-chromosome bottleneck different from the one seen in Scandinavia. Another explanation for the presence of R1a1a1b1a3-Z284 in the eastern Baltic area may be continuous contacts with Palaeo-Germanic populations: e.g. through the site of Kivutkalns, a major bronze-working centre located on a trade route that opened to the Baltic Sea on the west and led inland following the Daugava river, and through which surrounding populations might have been in contact (Mittnik, Wang, et al. 2018). Reported haplogroups include three out of seven samples from the western site of Turlojiškė, Lithuania (ca. 2000–600 BC), at the border with late Trzciniec (see §viii.8. Balto-Slavs), all three of hg. R1a1a1b-Z645, one of them a subclade of R1a1a1b1a2a-Z92, R1a1a1b1a2a1a-YP617 (formed ca. 1400 BC, TMRCA ca. 1400 BC); ten samples from Kivutkalns, Latvia (ca. 810–230 BC) also include only R1a1-M459 lineages, probably all seven of hg. R1a1a1b-Z645: five of them show hg. R1a1a1b1a2b-CTS1211, including four with mutation Y13467 (formed ca. 2000 BC, TMRCA ca. 2000 BC). Out of twenty-four Bronze Age individuals sampled from stone-cist graves in Estonia (Tambets, Saag, et al. 2018), all eighteen reported haplogroups are R1a-M420, probably all R1a1a1b1a-Z282. One outlier (ca. 1075 BC) shows influence from the west (Mittnik, Wang, et al. 2018), probably related to the interaction of Balto-Slavic populations in the west through Trzciniec. These findings suggest an admixture of incoming Corded Ware migrants of Battle Axe material culture admixing with sub-Neolithic populations of Narva and related eastern Baltic cultures rather than Comb Ceramic groups from the forest zone. Both the origin of males from Corded Ware and their prevalent admixture with western populations in the eastern Baltic area are frontally opposed to the traditional view of Uralic speakers stemming from Volosovo and related hunter-gatherer peoples, and supports the origin of Uralic speakers in Corded Ware migrants instead. Many R1a1a1b1a2-Z280 lineages (TMRCA ca. 2600 BC) are prevalent in north-eastern European populations around the Baltic: e.g. R1a1a1b1a2a-Z92 (TMRCA ca. 2500 BC), found in ancient samples from Lithuania and in modern north-eastern European populations; R1a1a1b1a2b-CTS1211 (TMRCA ca. 2200), with one ancient sample already found in the Battle Axe culture from Lithuania, and later in Latvia, is found widely distributed in modern populations around the Baltic Sea with basal, early and late subclades. Nevertheless, some late subclades were apparently incorporated into the Slavic expansion, possibly via Trzciniec-mediated interactions, such as R1a1a1b1a2b3-CTS3402 (TMRCA ca. 2200 BC). Finno-Samic is thought to have developed under strong Nordic Bronze Age influences upon the Baltic coast of Finland and Estonia. The Finno-Samic community, under strong, long-lasting Palaeo-Germanic influence—evidenced by Germanic loanwords representing different dialectal layers—would be thus represented by the transformation of Kiukainen into the Textile ceramic cultures, with Samic probably developing to the north of the Gulf of Finland while Fennic developed to the south, roughly corresponding to Paimio ceramics and Asva Ware respectively (Kallio 2014). The conservatism of Finno-Samic phonology relative to Proto-Uralic as late as the Bronze Age further confirms the lack of strong direct external influences, which finds its explanation in the lack of admixture of Corded Ware settlers in the area, and the succeeding contacts mainly with Corded Ware-derived groups, such as Netted Ware and Akozino–Akhmylovo to the east and south-east, Scandinavian peoples (those bilingual communities shifting to a Pre-Germanic language) to the west, and other Finno-Permic populations to the south-west, before their acculturation under expanding Proto-Baltic or Proto-Slavic populations. During the Early Iron Age, the physical separation of Fennic and Samic communities was probably complete, as reflected by the differing layers of Germanic loanwords in each branch (Kallio 2009, 2012, 2015). To the north of the Gulf of Finland, six individuals of the Lovozero culture from Bolshoy Oleni Ostrov (ca. 1610–1436 BC), two of hg. 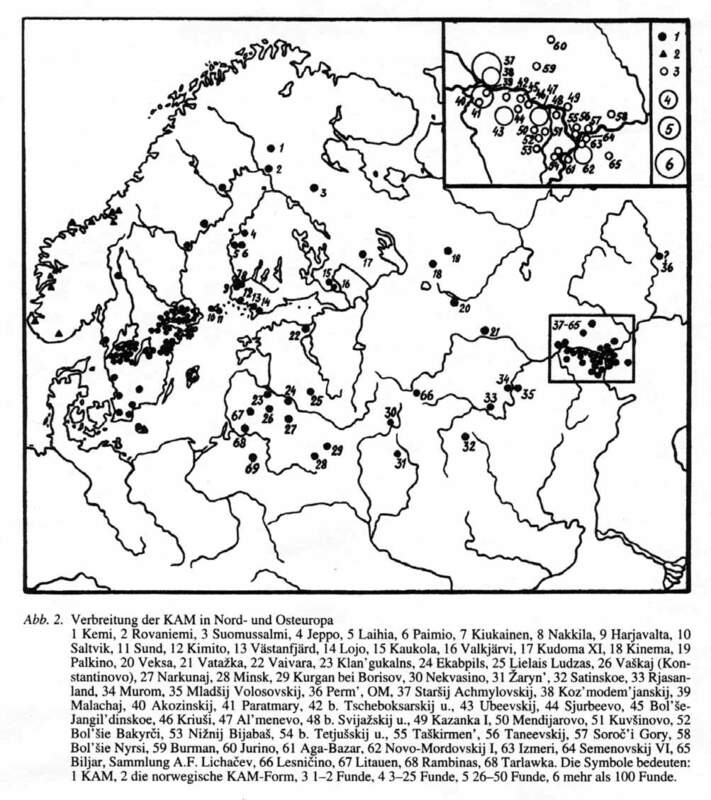 N1a1a1a1a-L392, show elevated Siberian ancestry—clustering along a Palaeosiberian cline connecting northern Eurasian peoples—and represent most likely a recent expansion of Paleo-Laplandic-speaking hunter-gatherers from west Circum-Arctic Eurasia into the Kola Peninsula, evidenced by the introduction of asbestos-mixed ceramics ca. 2000 BC, and the spread of even-based arrowheads in Lapland from ca. 1900 BC (Lamnidis et al. 2018). The nearest counterparts of Vardøy ceramics (ca. 1600–1300 BC) can be found on the Taymyr peninsula, much further to the east, compatible with the foreign ancestry found in Lovozero individuals related to available Glazkovo EBA samples (ca. 32%), from the Cis-Baikal area. Finally, the Imiyakhtakhskaya culture from Yakutia spread to the Kola Peninsula during the same period, also representing the expansion of Paleo-Siberian peoples of mainly N1a-L279 lineages across north Eurasia (Lamnidis et al. 2018). The Bolshoy Oleni Ostrov samples cluster in this ancient Palaeosiberian cline near modern Khants, which supports a close original source for both in Circum-Arctic Cis-Urals population. This movement probably displaced earlier Mesolithic pioneers of the Komsa and Suomusjärvi cultures—probably mainly of Baltic / Scandinavian hunter-gatherer ancestry and of I-M170, R1b1a1-P297(xM269), and R1a1-M459 (xZ645) lineages—from eastern and northern Fennoscandia into central Finland, where they evolved probably with the Kainuu culture. This population probably represents the Palaeo-Lakelandic speakers encountered by Proto-Samic peoples during their expansion to the north and east, reflected in Samic substrate words (Aikio 2012; Carpelan and Parpola 2017). Based on the prevalent diffusion of N1a1a1a1a2-Z1936 lineages (formed ca. 2800 BC, TMRCA ca. 2400 BC) in present-day populations of central Finland and around the Barents Sea, including northern Fennoscandia, this is probably the haplogroup associated with the expansion of west Eurasian Circum-Arctic hunter-gatherers to the west into the Kola Peninsula, introducing asbestos-mixed ceramics, even-based arrowheads, and speaking Palaeo-Laplandic, a substrate language of late Samic (Aikio 2012). An early Samic individual from Levänluhta in western Finland (ca. AD 388-547), with strontium isotope analysis showing mainly marine dietary resources, compatible with coastal resources 25–30 km to the north-west in the Bothnian Sea, shows an admixture similar to previous Battle Axe and Baltic Bronze Age samples, clustering closely to Battle Axe individuals from Scandinavia, and at the one extremity of the ancient Finno-Samic cluster (opposite to the Baltic Iron Age individual, see below), which supports the physical separation of the Saami population from innovations and population contacts that happened to the south, in the eastern Baltic region and the Gulf of Finland. Slightly later samples from the same site (ca. AD 405–555 and ca. AD 662-774) show signs of progressive admixture with Lovozero-like populations, evidenced by increased Siberian ancestry related to Bolshoy Oleni Ostrov samples (ca. 47%) and a cluster (Suppl. Graph. 14) intermediate between Baltic BA and Iron Age samples and Lovozero (Lamnidis et al. 2018). This is compatible with the spread of Samic speakers of the Sarsa culture at the same time as it developed into the Luukonsari culture: to the north admixing with Lovozero-derived Kjelmøy Ware peoples, of mainly hg. N1a1a1a1a-L392 (mainly of N1a1a1a1a2-Z1936 lineages); and to the east, admixing with Sirnihta and Anttila culture peoples from inner Finland and Karelia, likely speakers of Samic- or Volga-Finnic-related languages and Palaeo-Lakelandic peoples derived from Tomitsa and Kainuu ceramics, possibly already admixed with Palaeo-Laplandic peoples of Kola during this period. Two sampled historical Saami from Chalmny Varre (AD 18th – 19th c.), one of hg. I2a1a-P37.2, show similar intermediate ancestry to the mixed Levänluhta samples, between Baltic BA and Lovozero, but on the EHG and Baltic BA side of the previous cluster, with a corresponding increase in Steppe-related ancestry. One modern Saami, of hg. I1a1b3a1-, clusters close to these historical Saami (Lamnidis et al. 2018). · Among five sampled Iron Age individuals from tarand graves in Estonia, three are of hg. N1a1-M46, while two are of hg. R1a-M420 (Tambets, Saag, et al. 2018). Nevertheless, they cluster closer to Corded Ware samples than Baltic Bronze Age individuals, which suggests an origin of migrations close to the steppe, coincident with the influence of Akozino in the region. This could be linked to a number of innovations shared between Proto-Mordvinic and Proto-Fennic (on the southern Gulf of Finland), but not on Samic (Parpola 2013, 2018), although cultural contacts between Finland and the Gorodets culture lasted until the AD 7th–8th centuries, evidenced by imports from the Lomovatovo culture (Koryakova and Epimakhov 2007). · A sample of the Baltic Iron Age from northern Lithuania (ca. AD 1-600) shows hg. N1a1a1a1a1a1a1-L1025 (formed ca. 900 BC, TMRCA ca. 600 BC) a subclade of hg. N1a1a1a1a1a-VL29, clustering also closely to Corded Ware samples, and representing a population close to modern Finns (ca. 67%), who also present ancestry related to Levanluhta (ca. 33%), which in turn is associated with this sample (see above). This sample corresponds to a period and region of inhumations, among divergent burial traditions that could change abruptly (de Barros Damgaard, Marchi, et al. 2018). The presence of Proto-Baltic loanwords may be dated to the Early Iron Age, which places Fennic languages in the Gulf of Finland, in close contact with both Germanic and Baltic peoples, once the greater influence of Germanic over Finnic and Samic faded (Kallio 2008). · A late Viking from the town of Sigtuna, in eastern central Sweden (AD 10th–12th century), shows hg. N1a1a1a1a1a1a7-Y4341 (formed ca. 900 BC, TMRCA ca. 600 BC), also subclade of hg. N1a1a1a1a1a-VL29. This individual is of local origin, based on strontium isotope analysis and on his admixture among Nordic peoples (Krzewińska, Kjellström, et al. 2018), hence most likely part of lineages integrated with Proto-Germanic speakers since the expansion of Akozino warrior-traders, rather than a recent intrusion. · During AD 5th–10th century, people of present-day north-eastern Belarus, north-western Russia, south-eastern Estonia, and eastern Latvia buried part of their dead in sand barrows, mostly erected in groups on the banks of river valleys, usually in sandy pine forests. These are termed long barrows, and represents a local tradition before the Slavicisation of Russia (Tvauri 2007). A sample from Pskov (AD 8th–10th century), tentatively attributed to the incoming Krivichi Slavic tribe, shows hg. N1a-L279 (Chekunova et al. 2014). Figure 80. Distribution of finds of similar types of spherical weights, assumed to have been used for trade and transactions during the late Iron Age. Modified from Hedman (2003). Furthermore, the modern distribution of N1a1a1a1a1a-VL29 reveals a pattern consistent with an Iron Age expansion around the Baltic Sea, with the TMRCA of the most common lineages compatible with Iron Age expansions, found without particular territorial distinction from Kazakhstan and Russia in the east, through Finns, Estonians, Latvians, and Lithuanians, to Swedes, Norwegians, and Poles in the west. The genetic continuity in Estonia since the Bronze Age supports the late infiltration and expansion of foreign lineages from the east (mainly N1a1a1a1a1a-VL29) without cultural change, similar to the various Bronze Age and Iron Age haplogroup expansions in North-West Indo-European-speaking Europe different from the R1b1a1b1a1a-L151 lineages originally expanded with Bell Beakers. Supporting late intense cultural contacts in the Baltic during the Iron Age is the distribution of different types of weights used to determine the value of products in a certain amount of silver, suggesting that this was an accepted trading system to exchange goods (Figure 80). The assumed separation of Southern Estonian first from the common Fennic trunk supports the origin of Proto-Fennic in Estonia, which—based on the similarities of Finnish and Estonian—is estimated to have spread ca. 2,000 years ago (Kallio 2014). This corresponds to the Early Roman Iron Age, in the first centuries AD, characterised by tarand- or yard-type cemeteries, as well as new types of iron weapons and ornaments originally from Estonia and the Baltic on the south and the south-western coast of Finland. The expansion of Finnic to the north replaced Samic of central Finland, and probably displaced part of their population, who in turn must have replaced the remnants of Palaeosiberian and Palaeo-European groups in northern Fennoscandia up to the Germanic-speaking region. While N1a1a1a1a1a-VL29 lineages, already integrated into Fennic-speaking populations, may have undergone a further Y-chromosome bottleneck during the Finnic expansion, the presence of N1a1a1a1a2-Z1936 lineages (proper of Palaeo-Laplandic peoples) among central Finns suggests either an important role of cultural diffusion into the area, or a less important integration and later bottlenecks due to founder effects. Both options may be supported with the current genetic data, including a bottleneck estimated ca. AD 500–700 in modern mtDNA among Finns (Översti et al. 2017), and the known several-fold more identity-by-descent segments found in north-east Finns compared to south-west ones, due to the described recent expansion from the Gulf of Finland (Martin et al. 2018). Modern south-west Finns can be modelled as a mix of Nordic Iron Age (44%), Baltic Iron Age (ca. 45%), and Levänluhta (ca. 11%), whereas Vepsians show more Baltic IA and Levanluhta-related contributions, compatible with their ancient expansion from an Estonian homeland, respectively, to the north and east (Suppl. Graph. 15). Sampled medieval Estonians buried in rural cemeteries, representing the local class, cluster with modern Estonians, which in turn continue Iron Age ancestry in the region (between Bronze Age and Corded Ware populations), while certain urban elite individuals associated with the arrival of western Europeans bringing economic, cultural and political networks cluster genetically with modern Germans. Among modern Fennic populations, Estonians seem to be less affected by Siberian ancestry, showing more hg. R1a1a-M198 (ca. 35%), with less N1a1-M46 (ca. 32%) and I-M170 (ca. 18%). Karelians also show more R1a1a-M198 (ca. 41%) than N1a1-M46 (ca. 36%) and I-M170 (ca. 10%). Vepsians, clustering closer to eastern groups, show slightly more N1a1-M46 (ca. 38%) than R1a1a-M198 (ca. 36%). Saami show more N1a1-M46 (ca. 40%), with Saami from the Kola Peninsula showing more R1a1a-M198 (ca. 22%), than I-M170 (ca. 17%), and Saami from Sweden more I-M170 (ca. 33%) than R1a1a-M198 (ca. 18%). The genetic picture among modern Finns, with more N1a1-M46 (ca. 58%) and I-M170 (ca. 29%) than R1a1a-M198 (ca. 7%), is closer thus to modern (and thus probably ancient) Saami, and possibly also influenced by incoming Nordic peoples from Sweden, but there is little difference in the PCA with Vepsians or Karelians (Tambets, Yunusbayev, et al. 2018), evidencing the described recent founder effect. A medieval warrior from Janakkala in southern Finland (ca. AD 1250), buried with at least two swords, a spear, an axe, and other materials, shows mainly local admixture and hg. R1b1a1b1a1a2c1-L21, probably further subclade R1b1a1b1a1a2c1a2a2a1-S5982 (formed ca. 1200 BC, TMRCA ca. 1000 BC), which is almost exclusively found in the British Isles. This may support the initial assessment of the individual as an early crusader, although his admixture suggests the infiltration of this lineage among locals likely during the Crusade Period (Laakso 2017). A contemporary Golden Horde individual of a R1a1a1b1a2a-Z92 subclade, autosomally close to Baltic Bronze and Iron Age samples, is potentially related to the eastern European slave trade or to acculturated Fennic peoples or Volga Finns (see above §viii.8. Balto-Slavs). Both mediaeval samples further suggest that the diversity of haplogroups present after the Iron Age in Europe, and especially the bottlenecks under N1a1a1a1a2-Z1936 in Fennoscandia, are a recent phenomenon not associated with the spread of Uralic languages.